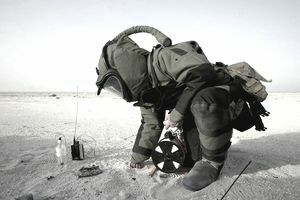 Explosive Ordnance Disposal (EOD) soldiers have a dangerous but critically important job in the Army. They're tasked with what the job title suggests: handling and safely disposing of unexploded ordnance. This can include a range of weapons: improvised explosive devices (IEDs), to chemical, biological or nuclear ordnance, weapons of mass destruction. These soldiers are highly trained and skilled. This is Army military occupational specialty (MOS) 89D. In addition to safely disposing of foreign and domestic ordnance and bombs, explosive ordnance disposal (EOD) specialists gather intelligence on ordnance and IEDs in preparation of VIP missions for the Secret Service, State Department, and other federal agencies. These soldiers also are trained to identify the presence of chemical agents, frequently with little advance warning time. They assist with setup and operation of emergency contamination control stations and emergency personnel decontamination stations in such situations. EOD specialists are also highly skilled at detecting buried ordnance, and as part of their job, they prepare and maintain all the tools, equipment and vehicles they'll use. Another part of the job of an explosive ordnance disposal specialist is to monitor for the presence of radiation. They're trained to read and interpret X-rays and diagrams, as well as other technical documents, and prepare technical intelligence and incident reports. These soldiers also provide formal instruction about unexploded ordnance to both military and civilian audiences. EODs spend the standard ten weeks in boot camp, formally known as Basic Combat Training (or just "Basic") and 39 weeks in Advanced Individual Training (AIT) at Fort Lee in Virginia. Their AIT is longer than a lot of other Army jobs since the work these soldiers do requires such a high level of skill and expertise. They learn the fundamentals of electronics and electricity; how to identify the hazards of both domestic and foreign munitions; demolition materials, procedures, and operations; and how to handle chemical and biological ordnance and operations. To be eligible for this Army job, you'll need at least a 110 in the skilled technical area of the Armed Services Vocational Aptitude Battery (ASVAB) tests. Due to the highly sensitive nature of the work these soldiers do, a top secret clearance from the Department of Defense is required. This is the highest level of security clearance and involves an extensive background check, including interviews with family, friends and past employers. Prior drug use may be disqualifying for this job. In addition, you have to be eligible for assignments both to a critical nuclear duty position and to a presidential support assignment. Soldiers in MOS 89D must be U.S. citizens. You must have normal color vision and a valid state driver's license. You should not be allergic to explosives (which would certainly make performing this job a challenge). Obviously, a lot of the work you'll do in this job will be specific to the Army, and there won't be a civilian equivalent. But the skills you'll learn will qualify you for work handling explosives and blasters, such as on demolition or construction sites. You should also be qualified to work as an occupational health and safety specialists or technician.